Tomorrow, 1 September, is the 144th anniversary of the French defeat at Sedan during the Franco-Prussian war. The next day, Emperor Napoleon III was taken into custody. Since this was a major event in the run-up to the Great War, I thought a bit of a primer on that 19th-century war was in order. Immediate Cause: Diplomatic maneuvering surrounding the candidacy of Prince Leopold of Hohenzollern-Sigmaringen for the Spanish throne, which raised the possibility of an alliance of Prussia and Spain vs. France. 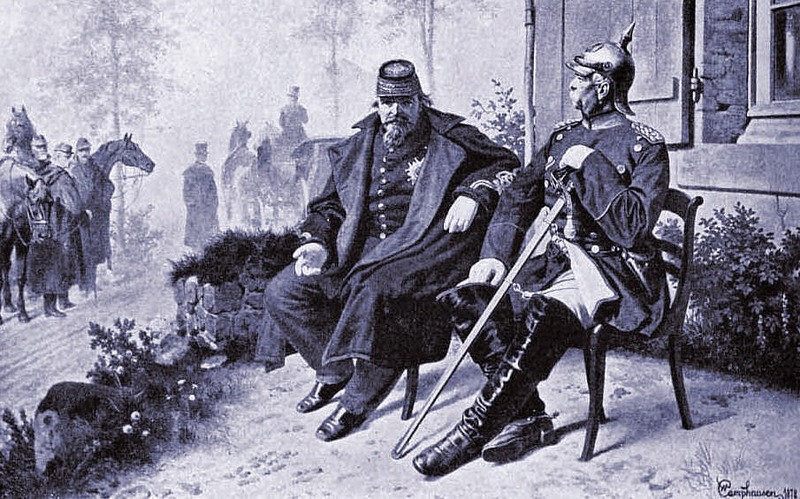 Bismarck thus provoked France into declaring war; most other German states joined Prussia. Hostilities: Superior tactics, organization, and weaponry resulted in an early series of victories culminating in the surrender of French Emperor Napoleon III at the Battle of Sedan. The struggle, however, continued due to considerable French resistance. Paris underwent a siege and an insurrection that established the short-lived Paris Commune while numerous battles and irregular actions were fought in the countryside. Results: French dominance of continental Europe ended, a unified German empire under Wilhelm I was created, and under the peace treaty France was forced to pay a large indemnity and cede Alsace and much of Lorraine to Germany. Are we going to have Tennyson's "Battle in the Air," and the nations deluging the nations with blood from the air? Now is the time to go on an exploring expedition to the North Pole, to come back and find settled order again. We're marching off in company with death...In thirteen days I'll probably be dead. 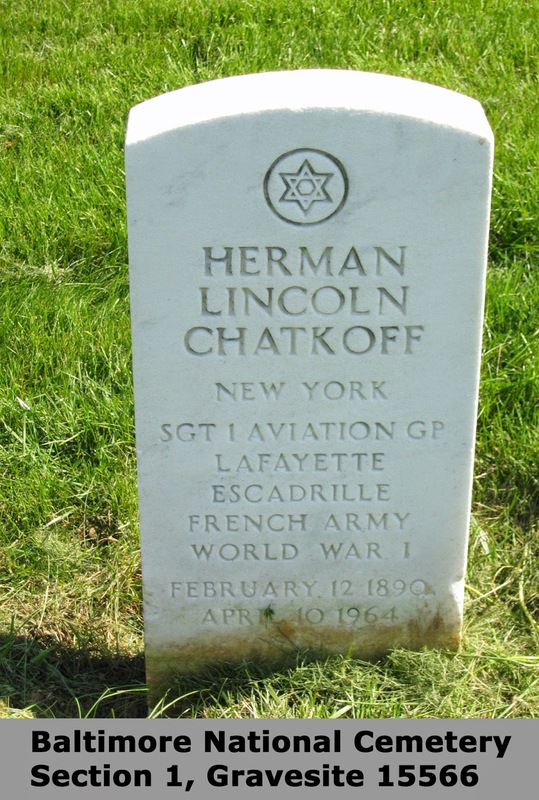 Seven weeks later Lichtenstein was killed in action. Against the vast majority of my countrymen, even at this moment, in the name of humanity and civilization, I protest against our share in the destruction of Germany. A month ago Europe was a peaceful comity of nations; if an Englishman killed a German, he was hanged. Now, if an Englishman kills a German, or if a German kills an Englishman, he is a patriot, who has deserved well of his country. It is my Royal and Imperial Command that you concentrate your energies for the immediate present upon one single purpose, and that is, that you address all your skill and all the valor of my soldiers to exterminate the treacherous English and walk over General French's contemptible little army. The United States must be neutral in fact as well as in name during these days that are to try men's souls. Victory will belong to the one who will have been the first to achieve an armor-plated machine capable of advancing on all ground and armed with a cannon. Where do all the women who have watched so carefully over the lives of their beloved ones get the heroism to send them to face the cannon? Longtime readers will recognize that a close version of this quotes article covering August 1914 appeared on Roads in August 2013. Since this month is so momentous [the "Guns of August" and all that], I decided to repeat this posting. However, I will be taking a hiatus from the quotes series until January 2015. At that time I'll resume this series following the war's centennial, month-by-month. The Butte de Warlencourt, a prehistoric burial mound on the side of the Albert to Bapaume Road, was, during the 1916 Battle of the Somme, a position of great strength for the Germans. It was fortified with barbed wire, riddled with tunnels, defended by machine guns and mortars, and stood as a sentinel in front of the major German trenches called Gird Trench and Gird Support. For much of the rest of October 1916 various British divisions were rotated through the trenches overlooked by the Butte. An attack toward the Butte was made on 7 October when the village of Le Sars was taken. It was not until 5 November that an all-out effort was made to take the Butte. 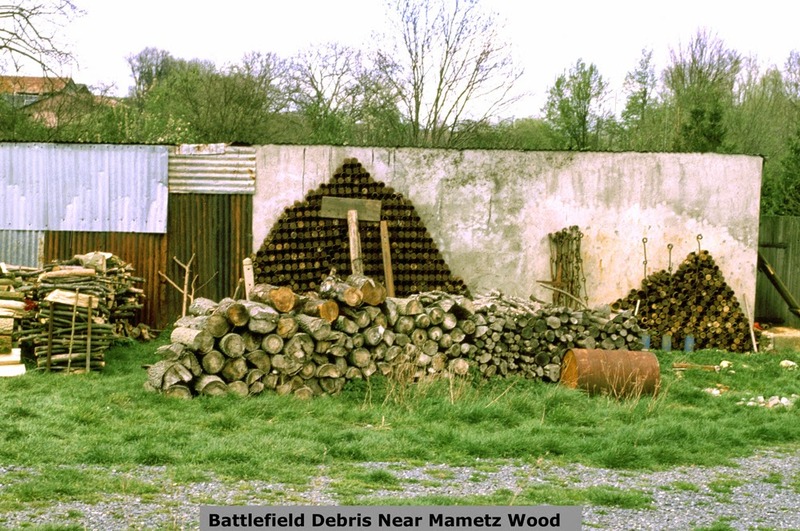 This was undertaken by the 7th, 8th, and 9th (DLI) of the 50th (Northumbrian) Division. Imagine a time before the information revolution, when the First World War involved all the great powers and the mighty conflict touched almost every family. How was the curiosity of the public about the war satisfied without television, documentary films, the Internet, or even radio in that age? This was accomplished by the printed press— newspapers and magazines. To supplement the reports of correspondents, detailed schematic drawings on every conceivable topic were used to help educate the public (and, naturally, to sell papers). Submarines, of course, were operated by all the larger combatants, but — due to their lethality — Germany's U-boats were a particular fascination. Displayed here are the inner workings of a German attack U-boat from an English-language source. In WWI a total of 375 U-boats sank 6,596 merchant ships for a total of 12,800,000 tons, including ships sunk by mines. The German Navy lost 178 U-boats in action. 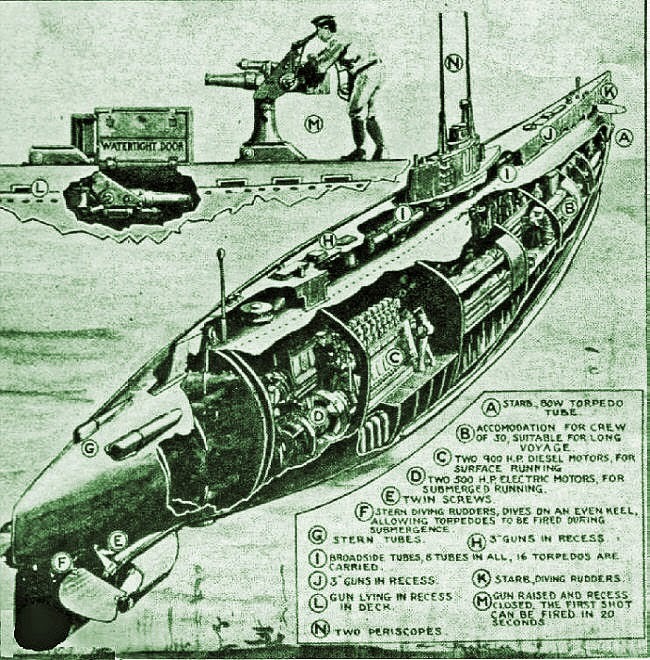 Even the 20th century's most notable futurist, however, had not anticipated the threat the submarine presented. Regular readers know we draw heavily on the collection of traveler and film documentarian Steve Miller. Here are a few of my favorites that Steve has sent over the years. Originally published serially in the Chattanooga Times in 1934, Hugh S. Thompson's memoir of his time as an officer in Company L, 168th Infantry Regiment, 42nd Division, is a graphic, personal view of one man's war. Thompson wrote this as a result of an exchange of letters with the parents of a young man in his platoon who had died right after Thompson had written a letter to his parents assuring them that their son, although wounded, was recovering nicely. The young man's mother wrote a scathing letter back to Thompson. This upset him greatly, but he developed a relationship of sorts with the mother, and she eventually asked that Thompson write a description of the final days of her son's life. The memoir is in part a result of her request. 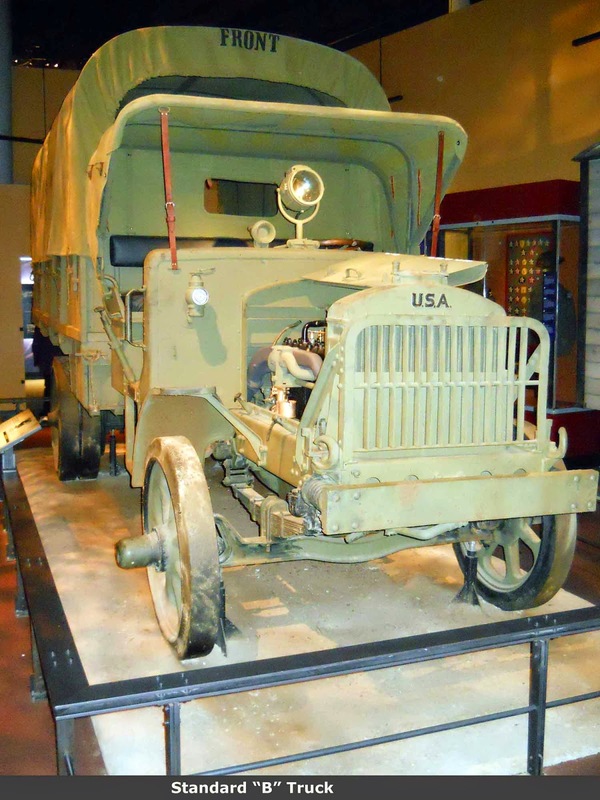 From a prominent Chattanooga family, Thompson joined the army early and was sent to France as part of the first group of casual officers to report to the American Expeditionary Forces; he was eventually assigned to the 42nd "Rainbow" Division as a platoon leader. In early 1918 Thompson and his regiment went into the line in Lorraine. 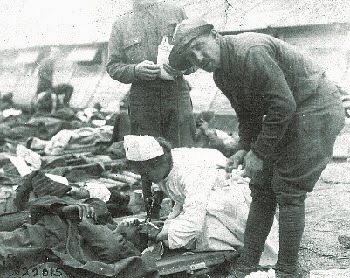 Shortly afterward he was gassed and evacuated, the first of three wounds he would suffer. 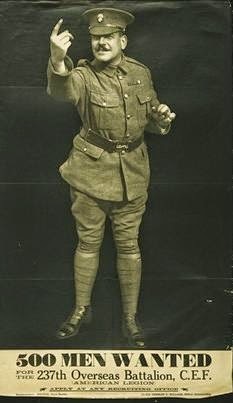 After each of his first two hospital stays, Thompson pushed to get back to his regiment even though he had a chance to stay behind a little longer or even to be assigned to a depot division. But Thompson, in common with most Doughboys, had found a home and family, of sorts, with the men of his platoon and company. Thompson gives us an honest account of the feelings of a young junior officer leading men in combat. He describes his affection for some of his fellow officers and men, and, refreshingly, he is not afraid to admit his fear as he enters combat. More than once he feels as if his decision to return to the front, rather than remain in a depot division, was a mistake. After his second wound, he had a chance to remain in the depot division. His thoughts must have been the same as other young men in his situation: "Why rush to get back into the war? Why not let nature take its course until the memories of the Champagne had thoroughly washed out?" Sawyer [the officer in charge of the work party] and his gang got busy with their stakes and mallets. There was a rattling of wire and smothered curses. The hammering of mallets on stakes split the inky darkness. Somebody whispered nervously, 'My God, them -------s 'll wake up th' Kaiser'. In another case, Thompson describes watching one of his platoon members, a young enlisted man, die at a hospital. "How much more would a man have to see?" asks Thompson. He also tells us what it was really like for a platoon leader waiting for H-hour prior to leading his men "over the top". Thompson makes us feel the suspense and fear that gripped him during the time just before jump-off as he counts down the minutes while making the rounds of his men, seeing to final dispositions and exchanging good luck wishes with them. All this serves to drive home the fact that Thompson was above all a rational person with feelings and desires that are common to us all. Thompson's description of his gassing and subsequent evacuation is vivid; it left me feeling suffocated and claustrophobic. The story of his wounding by shellfire gave me an inkling of the confusion, terror, and noise associated with such an event. Thompson's writing reflects the platoon leader's view; there are no lengthy descriptions of strategy or even of division-level action. His war, like the majority of enlisted men and junior officers, centered around his platoon and, at the most, his company. His concern for other companies is only evident in his desire to know how some of his friends, platoon leaders in those other companies, are getting along. Historian and author Robert H. Ferrell edited this new release, and he wisely kept his explanatory notes to a minimum; Thompson's narrative is sufficient in itself and needs only slight elucidation. In my opinion Ferrell has made a few minor errors in interpretation, but these fall into the "nit-picking" category. His introduction is helpful and puts Thompson and his family in context. Professor Ferrell and Texas A&M University Press are to be commended for publishing this and making it available to another generation of readers. Although the book has been in print since 2004, I think a review in this blog is warranted. Thompson wrote a memoir well worth reading. For anyone who would like an unvarnished view of an American junior officer's war, Trench Knives and Mustard Gas will provide entertaining reading. On 25 August 1914 a Russian pilot by the name of Pyotr Nesterov rammed his unarmed Morane Saulnier Type G aircraft into an Austrian Albatross B. Most likely Nesterov was trying to damage the enemy plane with his own landing gear. The two machines collided, became entangled and fell from the sky. Although both fliers were killed in the crash, the Russian aviator had in fact scored history’s first air combat kill. Britain’s first-ever air-to-air victory came later that same day, when two Avro 504 pilots used their aircraft to force a German Etrich Taube monoplane down into a field near Mons. The German pilot leapt from the cockpit and fled on foot into a nearby forest evading capture. On 5 October a French pilot named Louis Quenault would become the first in history to actually shoot down another aircraft in midair with a blast of gunfire. 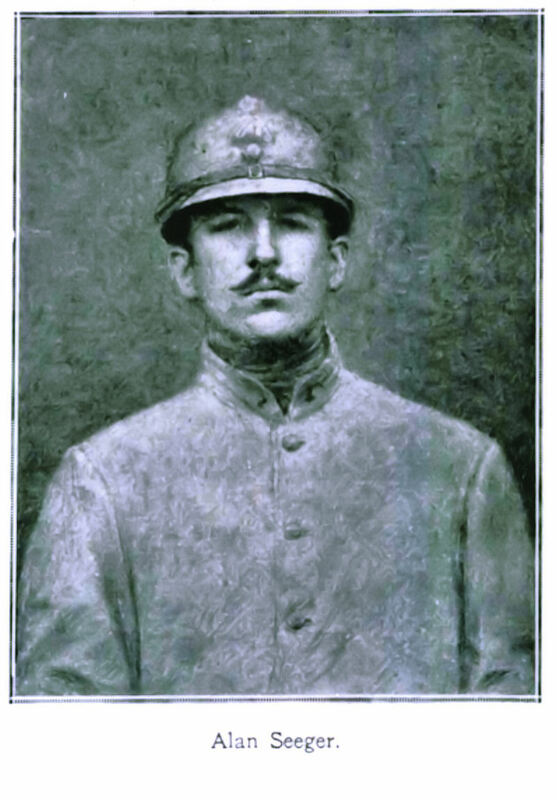 Paul Bolo — also known as Bolo Pasha — was executed as a French traitor in April 1918. Bolo's story is a bizarre one. A French citizen, he was born in Reunion and spent much of his youth in France. His adult life prior to the opening of hostilities in 1914 appears to have been spent as a full-fledged member of the underworld, operating in France as a confidence trickster. With the First World War under way, Bolo decided upon a confidence operation of surprising audacity, although he conceivably believed in the cause he espoused. In February 1915 he persuaded the Khedive of Egypt that the French public could be convinced of the merits of peace were he, Bolo, successful in raising substantial funds from Germany in order to aid the press campaign he had in mind. Thus Bolo spent a good deal of 1915–16 in traveling between the U.S. and Europe while employed by the Khedive. Subsequent inquiries revealed that Bolo had amassed a small fortune amounting to some £300,000 from a variety of German sources. Ultimately found out by the French authorities, Bolo was arrested while in Paris in September 1917. He was promptly charged with obtaining funds from a national enemy for the purpose of establishing a pacifist movement in France — a crime punishable by death. Found guilty of the charge and proclaimed a traitor Bolo was duly shot by firing quad at Vincennes fort on 17 April 1918. This Bolo Pasha, who had had his way with everybody and in almost every situation, had met a strong man at last! Bolo Pasha was one of those gentlemen who began life by betraying women; he ended it by betraying nations. There is a great difference between betraying women and betraying nations! 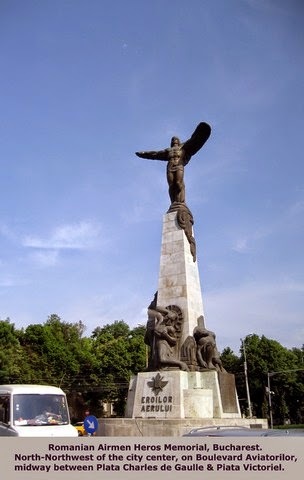 Women forgive and forget, but nations never, never! 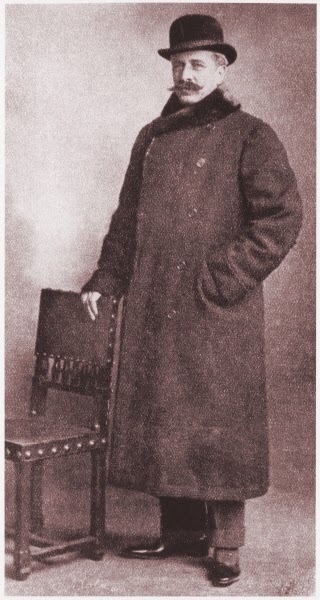 And so at the conclusion of their little interview Mr. Clemenceau escorted Bolo Pasha to the Forest of Vincennes, and placing him with his back to a wall, compelled him to face the business end of twelve French rifles. Bolo Pasha will never betray another nation. I want to tell you Americans that that is the only way to treat a traitor! A fantastic new website out of France has come to our attention. 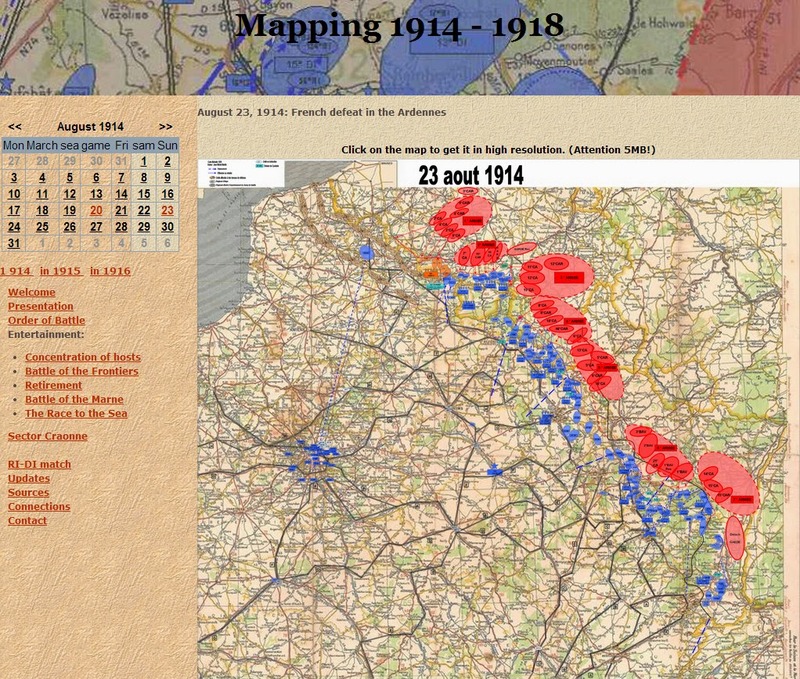 Cartographie 1914-1918 (trans: Mapping 1914-1918) shows the position of every major unit of all combatants on every day of the war. A large, high-resolution map similar to the one below (which is the smaller, low-resolution version you see when you first click on a date) is now available for each day through the end of July 1916. The map we are sharing with you is today's Centennial Map when the Battle of the Frontiers was reaching a crescendo. Tips of the hat to Don Jay and Steve Miller for bringing this site to our attention. 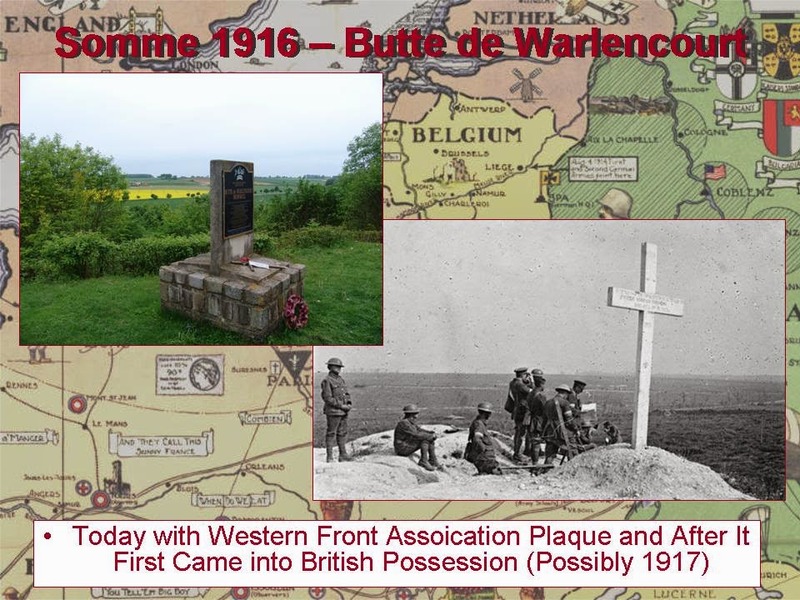 We first presented this article on 4 July 2013, the 97th anniversary of the day the Foreign Legion attacked at Belloy-en-Santerre during the Battle of the Somme. The attack was mounted from left to right over the field shown below. The village is just to the right of the image. An American Legionnaire was among those who fell that day. 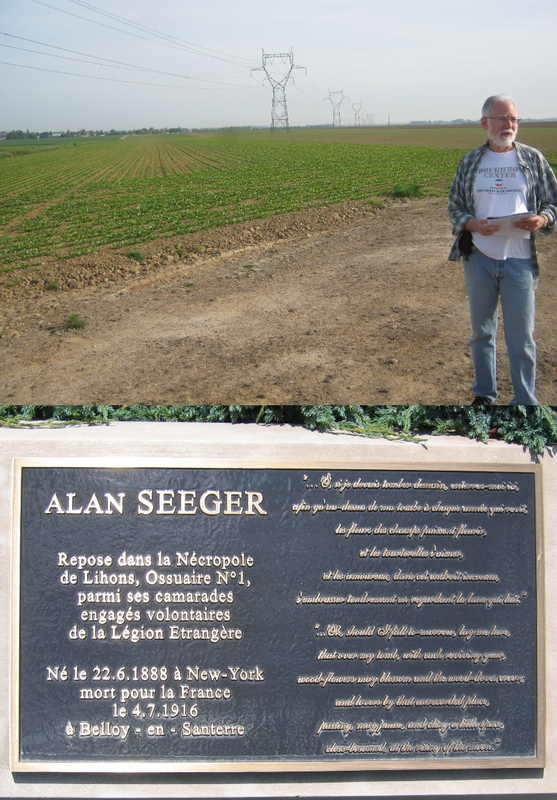 Above (top image), friend and traveling mate Mark Fowler of San Antonio, Texas, reads "Rendezvous" at the field where Alan Seeger fell during the Battle of the Somme. Below Mark is the plaque in the village of Belloy-en-Santerre honoring Seeger and identifying his burial site. Alan Seeger was born in New York in 1888. Encouraged by his family, he was attracted to literature at an early age, especially poetry, and was an enthusiastic contributor to the in-house magazine his family enjoyed producing. His wealthy family sent him to private school and then to Harvard College, where he was particularly interested in Celtic literature and edited and wrote poetry for the Harvard Monthly. His parents were dismayed when, after graduating from Harvard, he moved to Greenwich Village, where he lived a bohemian life. They sent him to Paris in 1912 to study at the Sorbonne, but this further encouraged his eccentric lifestyle and intensified his love of poetry. 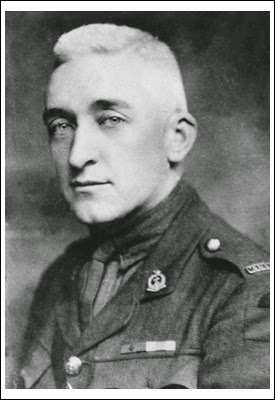 He also became interested in politics and wrote several sonnets and other poems on the events of the day that were leading up to the Great War. Although he was visiting London when war was declared, he at once rushed back to Paris and enlisted with some 40 other Americans in the French Foreign Legion. The training was demanding, but he appears to have been happy and proud to be fighting for a country he had come to love. His poems and letters home were now taking on a more fatalistic theme and also expressed the classical sentiment that death for a good soldier could be a beautiful and noble thing. Seeger was soon to see action with the 2nd Foreign Regiment, action which gave him experience and also material for his poetry. "The Aisne (1914-1915)" describes his first experience of battle along the Chemin des Dames. By September 1915 he was in the thick of the Battle of Champagne, which he vividly described in his letters home. There, after seeing grape pickers busy not far from the fighting, he wrote a long poem in which he appealed to wine drinkers to "Drink sometimes…to those whose blood, in pious duty shed/Hallows the soil where that same wine had birth" (Champagne 1914-1915). Romantic poet, dedicated diarist, and warrior, all of Seeger's writings in one volume. After a spell of sick leave and recuperation for bronchitis he returned to the front. He was scarcely inactive; according to one biographer, "He delighted in sneaking off on solitary scouting excursions, bringing back scraps of German newspapers and leaving his visiting card on the German wire…he longed for the Croix de Guerre." When the blood baths of Verdun and then the Somme developed, Seeger longed to be in the thick of things, and at this time he wrote what is considered by many to be the best American poem of WWI — "I Have a Rendezvous with Death." Few poems have been so fatalistic and at the same time cruelly prophetic. On 4 July 1916 Seeger's section was ordered to take the village of Belloy-en-Santerre. As he charged forward, German machine guns opened up from a nearby hollow, and Legionnaire Seeger made his rendezvous. During the last year of the Great War, Mte Grappa, just 35 miles northwest of Venice became the last mountain bastion against a potential severing of the Italian frontline and encirclement of their forces deployed along the Piave River. 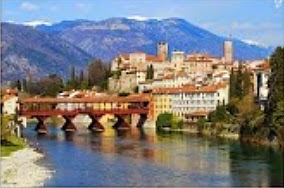 Immediately south of the mountain on the Brenta River is located the picturesque old Venetian town of Bassano del Grappa. 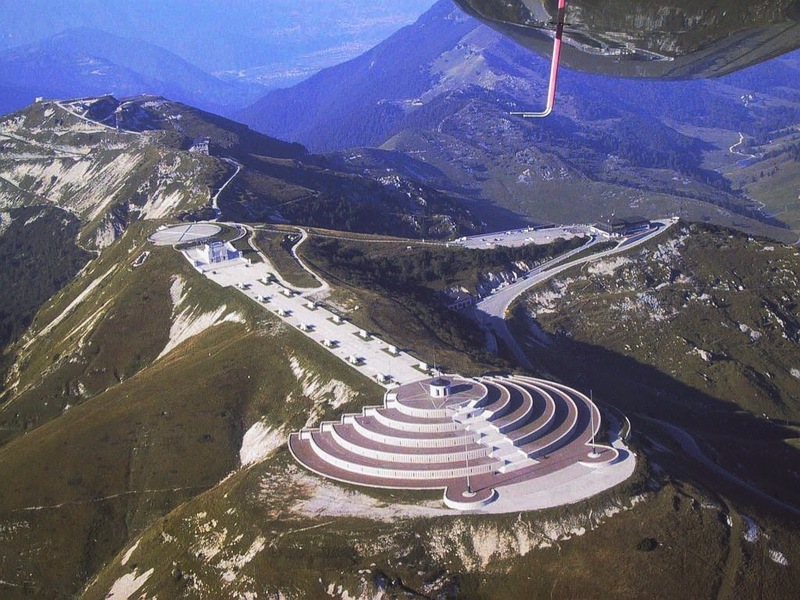 In late 1917 this became the major logistical and transportation center supporting the defenders atop Mte Grappa. Today Bassano, with its heritage of heroism during both World Wars, beautiful architecture, museums and ceramics industry, is a tourist's favorite. The most famous war monument in Bassano is the covered Ponte Vecchio, or the Alpini Bridge, over the Brenta. Built before 1209 and destroyed at various times by floods and war actions, it was remodelled several times to Andrea Palladio's design of 1568. During the Great War it became famous as the Alpini Bridge after the elite mountain troops who marched over it on their way to Mte Grappa. While crossing the bridge they sang the sentimental song "Sul Ponte di Bassano" — "On the Bridge of Bassano" — about kissing a pretty girl and squeezing her hand as they parted. 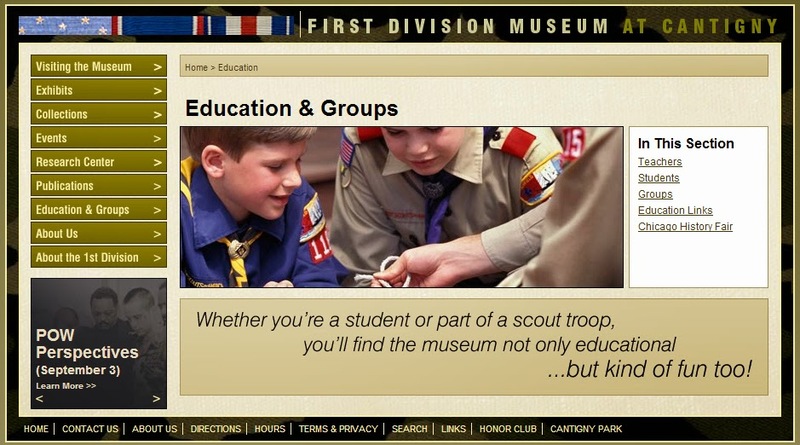 The First Division Museum at Cantigny provides a wide range of aids for teachers who are trying to give their students some appreciation of the American experience of World War I. 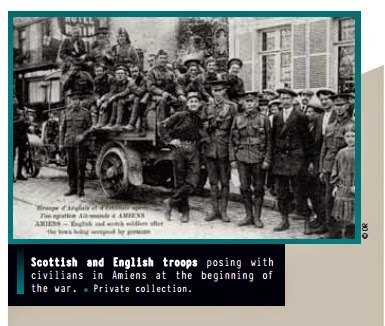 The resources are constantly being added to, but what is available — mostly online — is impressive including the story of Veterans/Armistice Day, a history trunk of a typical WWI Doughboy, and resource packs that include a great collection of letters and photos from 1st Division veteran Max Ottenfeld, who served in France. Well I hope this letter will find you all well and in the best of health. For myself I can say that I am feeling pretty fine considering where I am at. I bet you will be surprised when you find out that I am in a hospital, but don’t worry because by the time you get this letter I will be well and back to my outfit a long time. I was gassed Oct. 9 but didn’t go to the hospital until the 12th. I expect to be out in a week or so because I didn’t get it bad. You can see that I am feeling pretty good by the way I write this letter. I am up and walking around and you ought to see me at “chow” time, I can’t get enough to eat s a [?] continually kick. All I wish is that I was back to my outfit and then I would be all right. I left them 12th and the next day was to be pay day so I am out of luck for some money, but I don’t need it here and besides the month is almost over and I’ll have two months coming instead of one. Since I wrote last, I have been through h-- a good many times but still am alive and kicking. I’ve been over the “tops” a good many times since then and have seen all of the worst horrors of the war. Seeing dead and wounded now is nothing new to me. To End All Wars is an unusual history of World War One because it combines the stories of those who fought with those who chose not to. The war cast doubt on the "reasonableness of humanity". Only one group, argues Hochschild, remained "reasonable throughout — the conscientious objectors. Their story is not victorious, he concludes, because war is still with us. Hothschild describes the war as a conflict not only of loyalties but also of dreams. The first three parts of To End All Wars introduce the characters whom Hochschild follows throughout the war years. 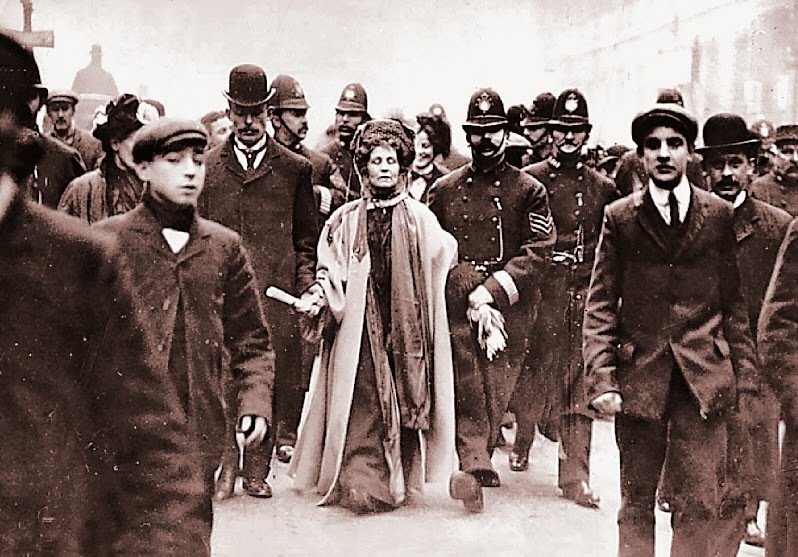 They include generals, trade unionists, feminists, agents provocateurs, a writer, lion tamer, a cabinet minister, a working-class journalist, three soldiers brought before a firing squad, and a young idealist. In the first few months, the voices against war were few. Indeed, military recruiters were warmly welcomed everywhere, notes Hochschild, because the war was associated with glory, purification, and liberation. The suffragette Sylvia Pankhurst was one of the few women to speak out against the war. Her views are discussed in Chapter 8 against the background of the losses in battle that began to be reported in newspapers like the Times. In Chapter 11, "In the Thick of It", Hochschild discusses the reactions to the German bombing of London in 1915. He discusses how Bertrand Russell, a prominent antiwar activist, heard "a shout of bestial triumph in the street". On leaping out of bed to investigate, Russell realized with disgust that people were shouting with joy because the German occupants of a zeppelin were burning to death. Chapter 11 also describes how Sylvia Pankhurst watched in horror as a German baker was badly beaten and a German woman was beaten unconscious. The losses at Loos and the introduction of conscription brought the issue of conscientious objection to the fore. Chapter 13, "We Regret Nothing", is devoted to the principles of pacifism and the bravery of its practitioners. Describing Britain's antiwar movement, it emphasizes the courage of the conscientious objector: "When the guns were firing and the pressure from friends and family to support the war effort was overwhelming, it required rare courage to resist" — a conclusion drawn also by Felicity Goodall in We Will Not Go to War (see my review). We were placed with our faces to the barbed wire of the inner fence . . . . I found myself drawn so closely to the fence that when I wished to turn my head I had to do so cautiously to avoid my face being torn by the barbs. To make matters less comfortable, it came on to rain and the cold wind blew straight across the top of the hill. Conscientious objectors went on hunger strikes and were force-fed like the suffragettes. It was the rule of silence, however, that was generally considered the most trying feature of imprisonment. The war unleashed witch hunts for traitors. The general public fury directed at conscientious objectors, particularly after the introduction of conscription, was enormous. 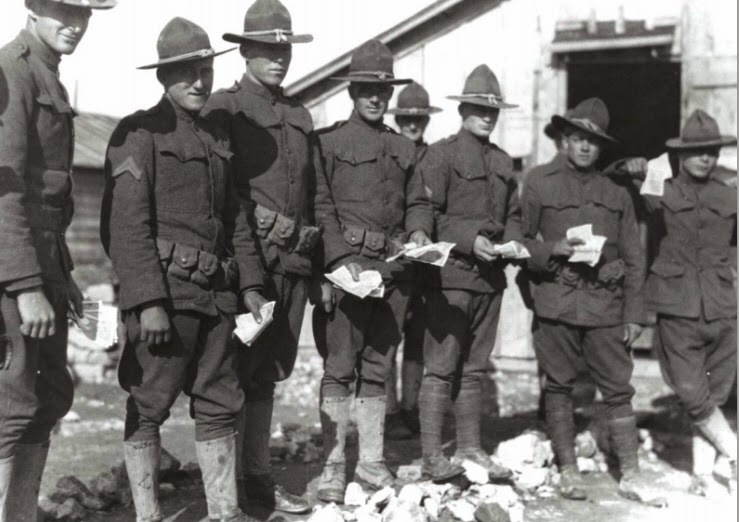 British conscientious objectors were able to take some courage from the 500 American war resisters who, with the introduction of conscription (the draft) by the Selective Service Act in 1917, also refused any sort of alternative service and went to prison. One well-known resister was the labor leader Eugene V. Debs, who had been imprisoned for giving a series of antiwar speeches. Refusing to repent on the grounds that he was "standing like a man", he was still in his cell in the Atlanta Federal Penitentiary in 1920. The final chapter of To End All Wars, "An Imaginary Cemetery", is not in honor of those who were confident that they would win their struggle through fighting but of the pacifists who knew in advance that they would lose — conscientious objectors like Bertrand Russell, who later declared, "I felt that for the honor of human nature those who were not swept off their feet should show that they stood firm." 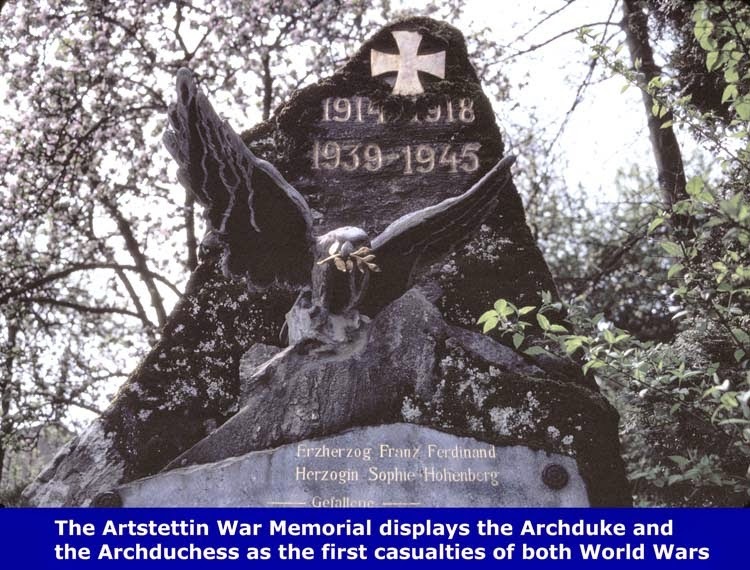 As Hochschild concludes in the final paragraph, "their battle could not be won in 1914–1918, but it remained, and still remains, to be fought again — and again." To End All Wars is a remarkable account of a group who stood firm, resisted public opinion, and paid a high price for their principles. 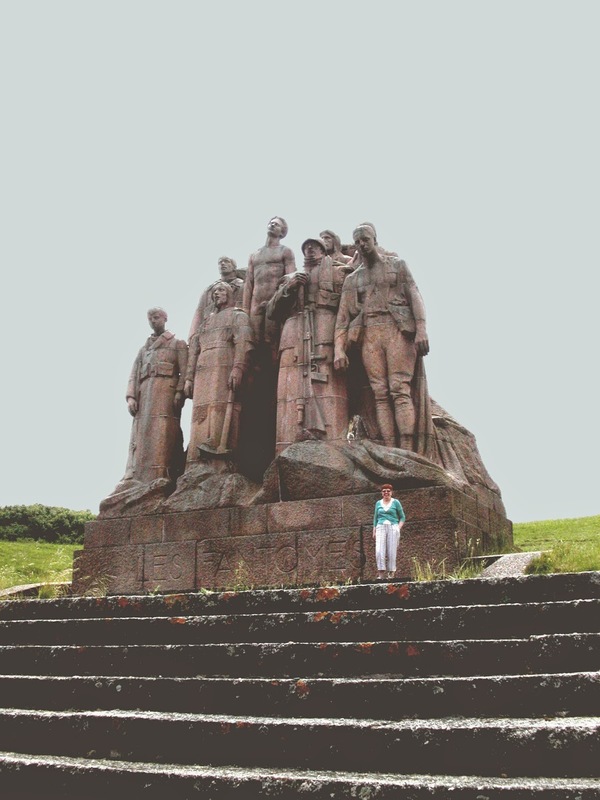 Hochschild's study is particularly effective because it integrates the story of the conscientious objector into the wider context of the war. It also tells the story of the individual. The product of many years of research, To End All Wars is copiously annotated and contains an extensive bibliography. At the same time, it is highly readable. Above all, it is both compassionate and sympathetic. There's a lot of theoretical stuff written about "Revolutions in Military Affairs". Here's some down to earth changes that came about in the Great War. It remains to mention two allies of [the WWI] infantrymen that virtually revolutionized their combat methods. 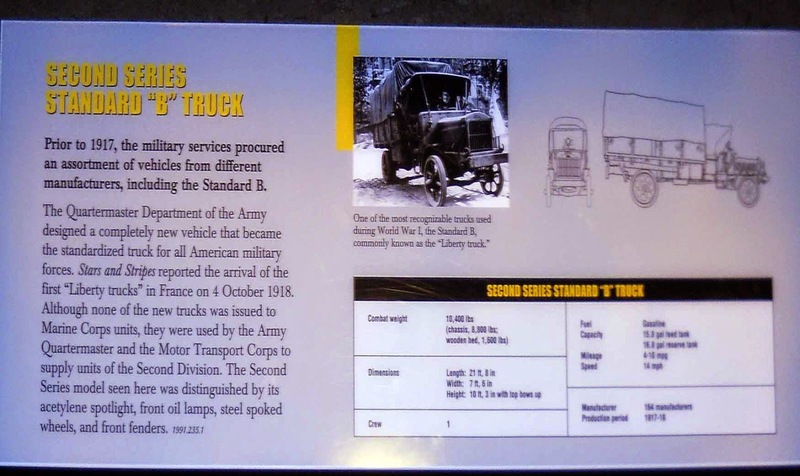 The first was the motor truck, which gave foot soldiers greater mobility than they ever before had. 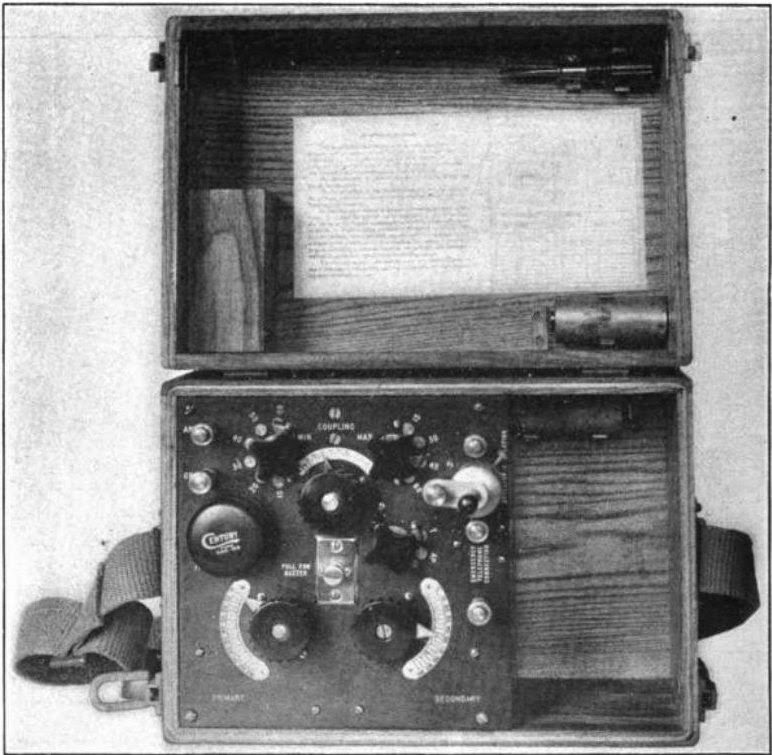 The second was a miscellany of signal equipment. This helped the infantry to operate with some degree of coordination on huge battlefields where arm signals could no longer be seen and noise drowned out the human voice. It aided in making foot troops an effective instrument of the will of the commander and served to rectify, at least a little, the disorganization that resulted from the necessity for soldiers to disperse widely in order to survive. Shouldn't Those "Last 100 Days" Be the "Last 120 Days"? I have been thinking of writing this posting since we published a positive review of Nick Lloyd's Hundred Days: The Campaign That Ended the War a few weeks ago. That book is well written and highly informative, but the focus on the "Last 100 Days" has rubbed me the wrong way since the late, and great, historian John Terraine first laid it on me in 1989. First, it is factually wrong! It presumes, argues, or suggests that the tide of battle in the Great War was turned due to the victory east of Amiens on 8 August 1918. The turning point of the war — the beginning of the end game — indisputably, came on 15 July 1918. That was 120 days from the end of the war, not 100 (or 96 if you are counting accurately). Second, examinations of the "Last 100 Days" tend to be heavily Anglo-centric and downplay the contributions of the other Allies, the AEF for sure, but most glaringly, the French Army. None of these comments are meant to disparage the tremendous achievement of the BEF in this period, but the French after their 1917 debacle were recovering. By the second half of 1918 they were once again mounting significant and large offensive operations, without which the broad Allied "push back" of the war's concluding days would not have been possible. Third, the role played by most important general of 1918, Ferdinand Foch, is almost always downplayed when the "Last 100 Days" are the topic. (Nick Lloyd's work is a BIG exception to this.) It appears to me, in some cases (not all), the successes of the British Army and its commander-in-chief in this period are emphasized to bolster the arguments of "pro-Haig" elements (not without some justification) in that never ending debate over the field marshal's merits. In his memoirs, General Ludendorff wrote that the Second Battle of the Marne had been the critical turning point in the war: "This was the first great setback for Germany. There now developed the very situation which I had endeavored to prevent. The initiative passed to the enemy. Germany's position was extremely serious. It was no longer possible to win the war in a military sense." The battle opened with the fifth German offensive of 1918 and was followed three days later by an Allied counteroffensive, which lasted until early September. That initial defeat, in what amounted to a single day, of a German attack on a 55-mile front from Château-Thierry to east of Reims, would be the Allies' first clear victory in 1918 on the Western Front. Germany would never mount another offensive nor celebrate another victory after 15 July 1918. Mangin's Tenth Army began the second phase of the battle at 4:35 a.m. on July 18. More than 21,000 artillery pieces opened fire simultaneously on German positions. Unlike the German barrage just three days earlier, the Allied cannonade of July 18 caught their enemies completely by surprise. The first day of the Allied counteroffensive was a massive success. 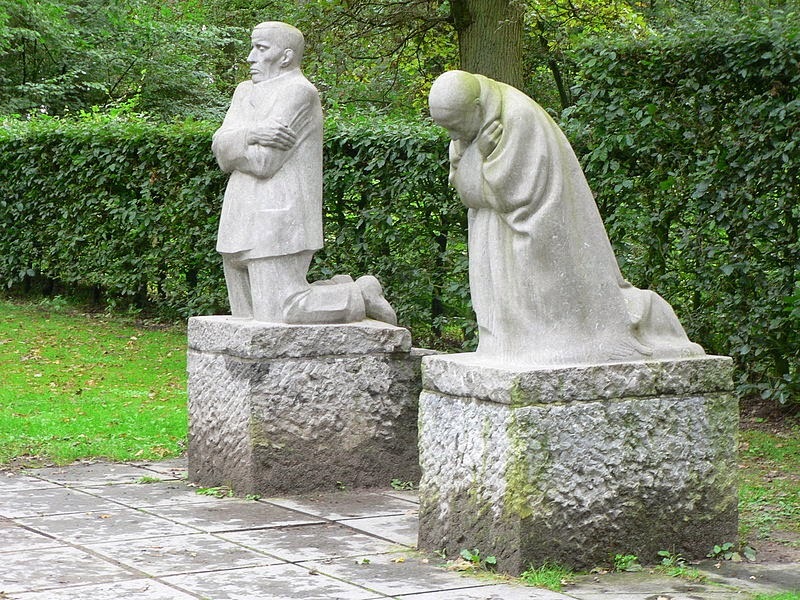 In total, the Allies captured 20,000 prisoners of war. 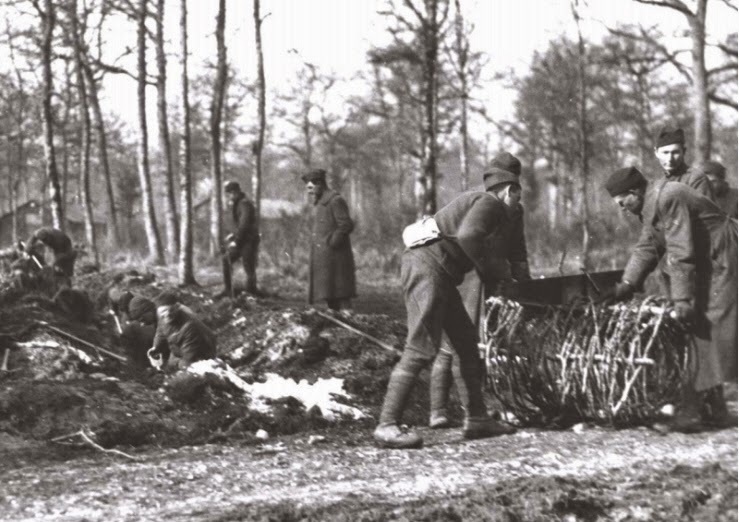 One American regiment had captured 3,000 prisoners from five different German divisions, an indication of the confusion in German lines. 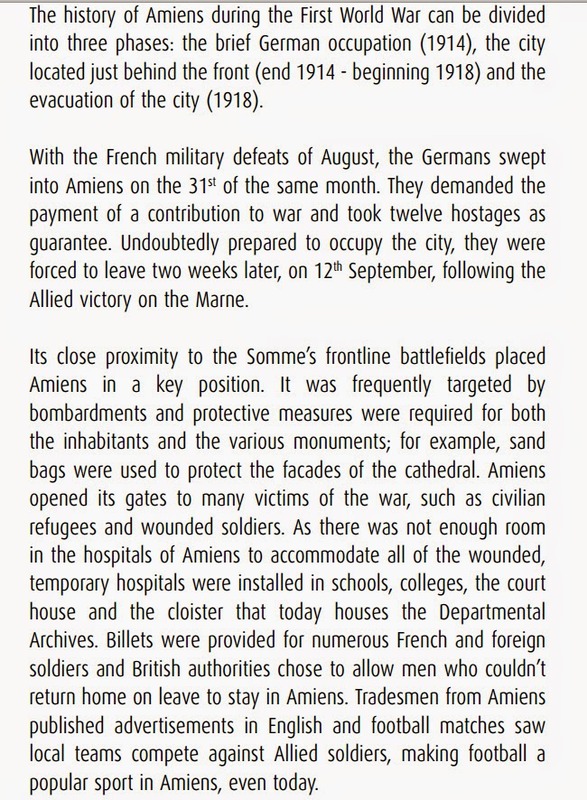 The number of German prisoners on this first day exceeds the number of Germans taken on the first day (17,000) of the Battle of Amiens, which began on 8 August 1918, in Ludendorff's words the "black day" of the German army. A black day it surely was, but in terms of both raw number of Germans who had surrendered and the tremendous shift in momentum, July 18 was significantly more important. One additional point is worth noting. The reserves that Ludendorff called upon to prevent an utter disaster in the Marne salient in July were those intended for another German offensive against the British Army in Flanders, Operation Hagen, scheduled for 1 August. Thus, had the Allies not administered the double defensive/offensive defeats of the German forces in July, the British forces would have had the Germans at their throats soon again in Flanders and very likely would not have had the freedom of action to launch their 8 August attack in the Somme sector. In any case, I look forward to publishing someday a review of a work titled The Last 120 Days of the Great War. This is an opinion piece by the editor, Mike Hanlon, who takes full responsibility for what is written herein. Nevinson's formative years as a student were spent at the Slade School of Art (1909–12) in London. The Futurist Exhibition of March 1912, held at the Sackville Gallery, London, proved decisive for his development. 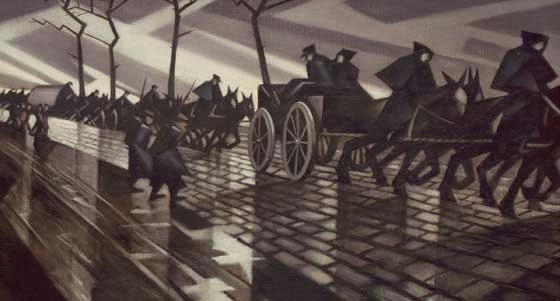 Nevinson became the leading figure in English Futurism. 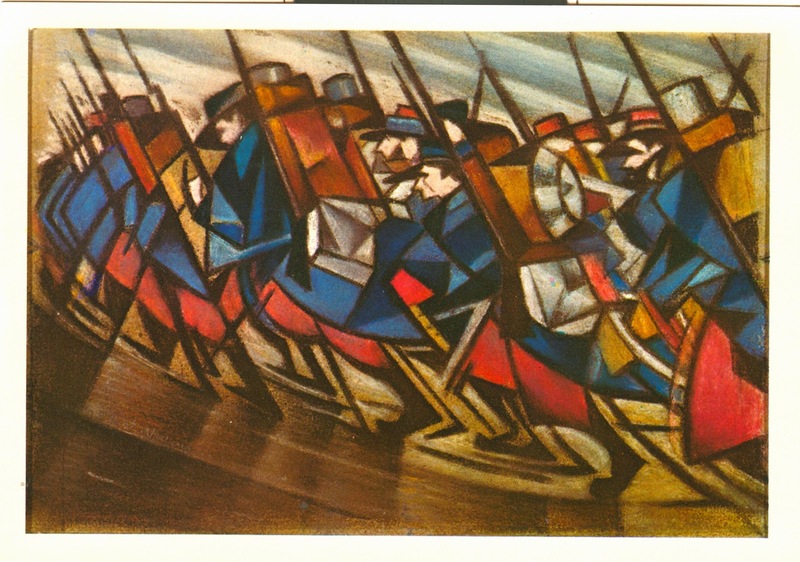 In June 1914 he published with the Italian Futurist leader F.T. Marinetti, the inflammatory manifesto Vital English Art, which set him apart from the Vorticists around Wyndham Lewis. The Vorticists included Edward Wadsworth, David Bomberg, and William Roberts, all of whom were former classmates of Nevinson at the Slade before the war. At the outbreak of the First World War (1914–18), C.R.W. Nevinson volunteered as a Friends ambulance driver in Flanders and then as a private in the Royal Army Medical Corps until January 1916, when he was invalided out. 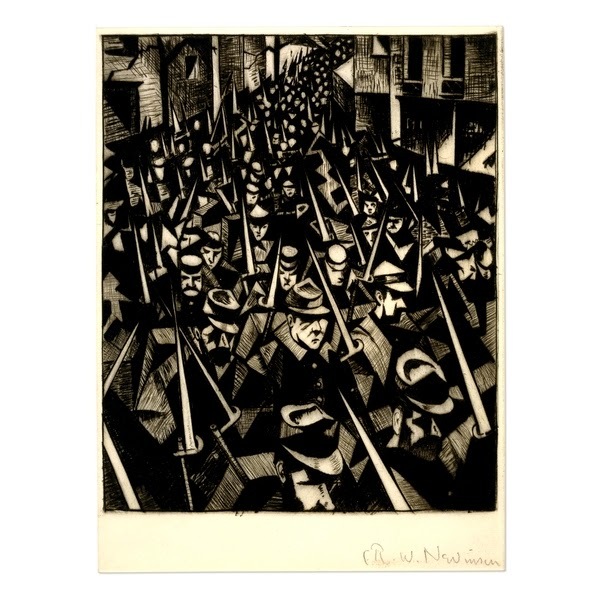 This print comes from a group of drypoints and related paintings based on his war experiences which were shown at Nevinson's first solo exhibition at the Leicester Galleries in London in 1916. The success of the exhibition led to his appointment as an official war artist and to a set of lithographs entitled "Making Aircraft" for the series recording Britain's Efforts and Ideals commissioned by the Ministry of Information during the First World War. Bleak, outspoken, and often angry, his paintings of 1915–16 are among the masterpieces of his career, bravely opposing the prevailing jingoistic tendency. 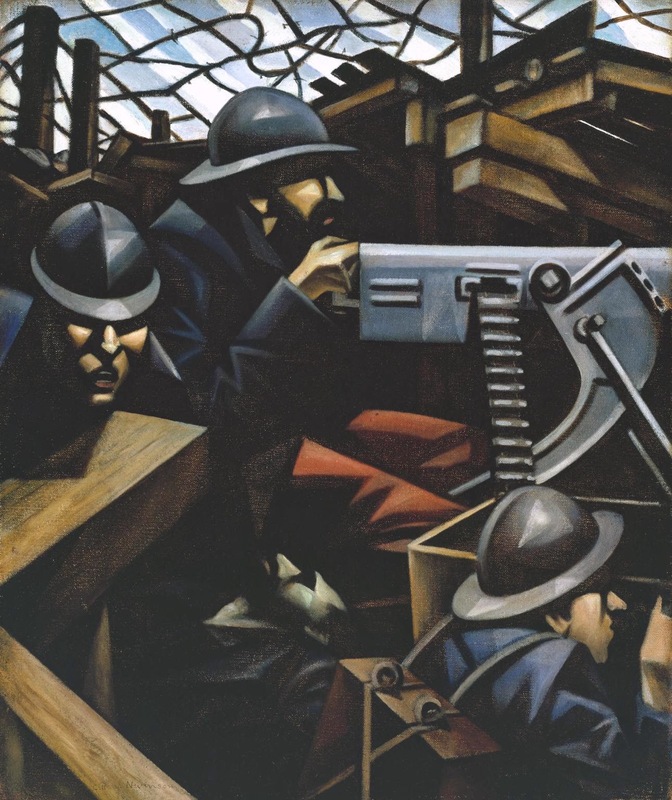 Always seeking a public platform for his art, Nevinson told the Daily Express in 1915: "Our Futurist technique is the only possible medium to express the crudeness, violence, and brutality of the emotions seen and felt on the present battlefields of Europe." However, by 1919 he had given up Futurism. Retreating instead to a more traditional vision, he painted lively interpretations of New York, which fuse a lingering love of Futurist angularity with a new respect for naturalistic observation. 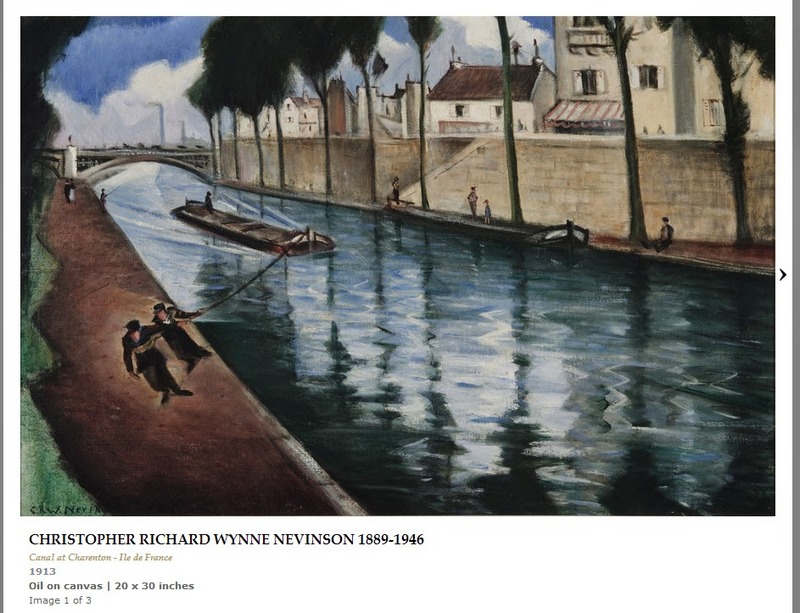 Nevinson was at his best when dealing with the dynamism and vertiginous scale of big city life. In later years he concentrated more on pastoral scenes and flower pieces, where a gentler mood prevailed. Built on the site of the former Thiepval Chateau. The huge brick structure, which dominates the rural scene, has 16 piers faced with Portland stone and is 150 feet (46m) high. It has foundations 19 feet (6m) thick, required due to extensive tunneling beneath the structure. Designed by Sir Edwin Lutyens, the memorial was built between 1928 and 1932 and is the biggest British battle memorial in the world. Over 72,000 names are listed on the memorial — all men who were lost in the Battle of the Somme, but whose remains were never discovered. 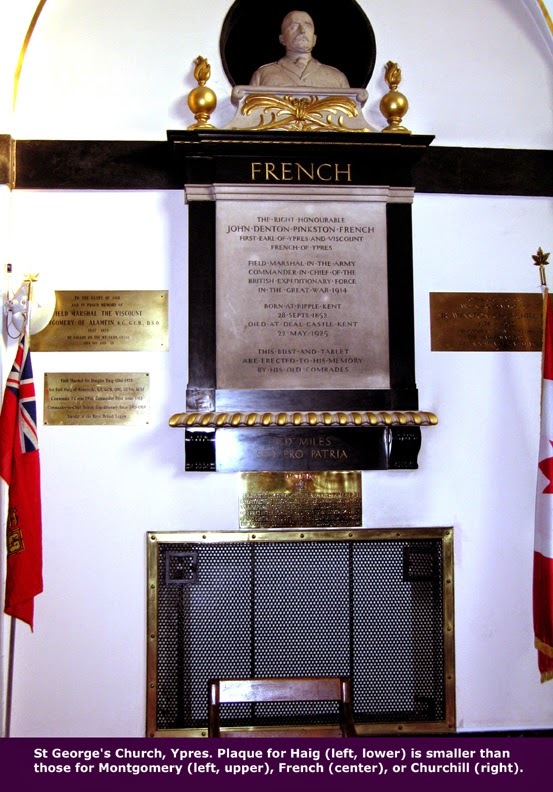 The French Tricolor also flies over the memorial. 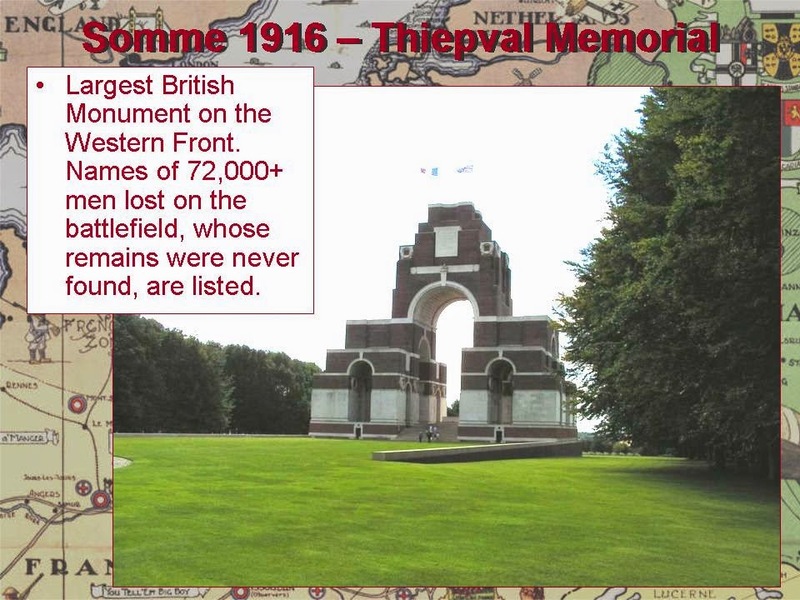 In addition to being a Memorial to the missing, Thiepval is also a battle memorial commemorating the Anglo-French offensive on the Somme in 1916 and is sited on top of the hill that was one of the major objectives . In recognition of the joint nature of the Allied endeavors in 1916, an Anglo-French cemetery is laid out in front of the Memorial with equal numbers of French and British burials (300 each). The Memorial is the largest ever built by the Commonwealth War Graves Commission. A major remembrance ceremony is held there each year on 1 July (the first day of the Battle of the Somme). There is a visitor center at the site which aims to tell the story of the battle, rather than any of the men who fought in this battle. On 1 July 1916 in the opening of the Battle of the Somme, the 32nd British Division was utterly devastated and repulsed in their effort to take this position. It was not until the following 26 September that the chateau and village were finally cleared by the 18th Division. Those numbers include both U.S. citizens living in Canada and Americans who crossed the border to join the fight — many of them motivated by the sinking of the Lusitania in May 1915. The 97th Battalion reached its full strength of 1,400 men by March 1916 but didn’t ship out until August — and in the months in between, the restless soldiers became known for getting into trouble in Toronto. 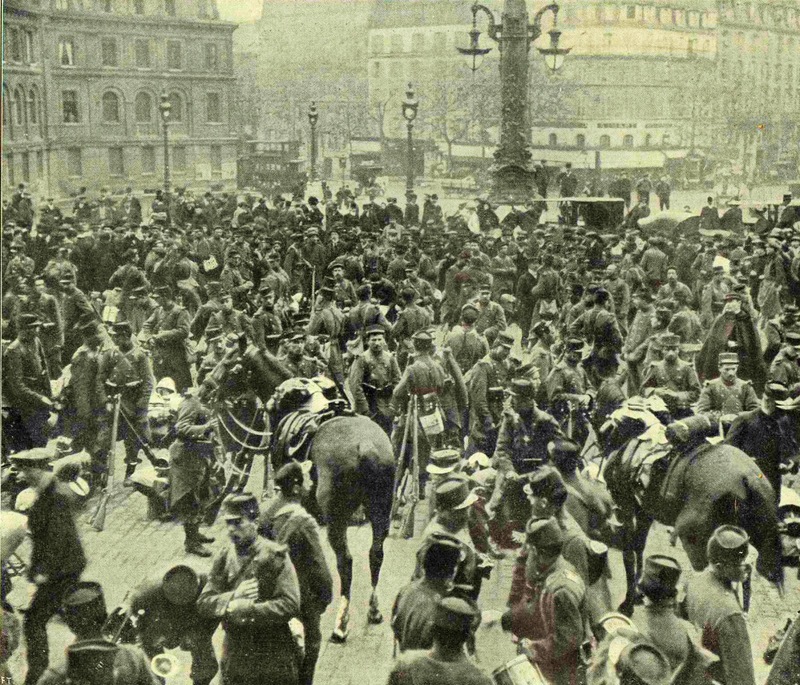 When the battalion arrived in Europe, it was broken up, its men sent to other units as reinforcements. On 25 July, the Museum of the History of Religion in St. Petersburg opens a major exhibition, "For Faith, Tsar and Fatherland", timed to the 100th anniversary of the outbreak of the First World War — one of the largest armed conflicts in history. More than 120 unique items of the museum's collection will reveal a hitherto unknown page of military history — the activity of "spiritual front" in force in all European armies in the early 20th century. 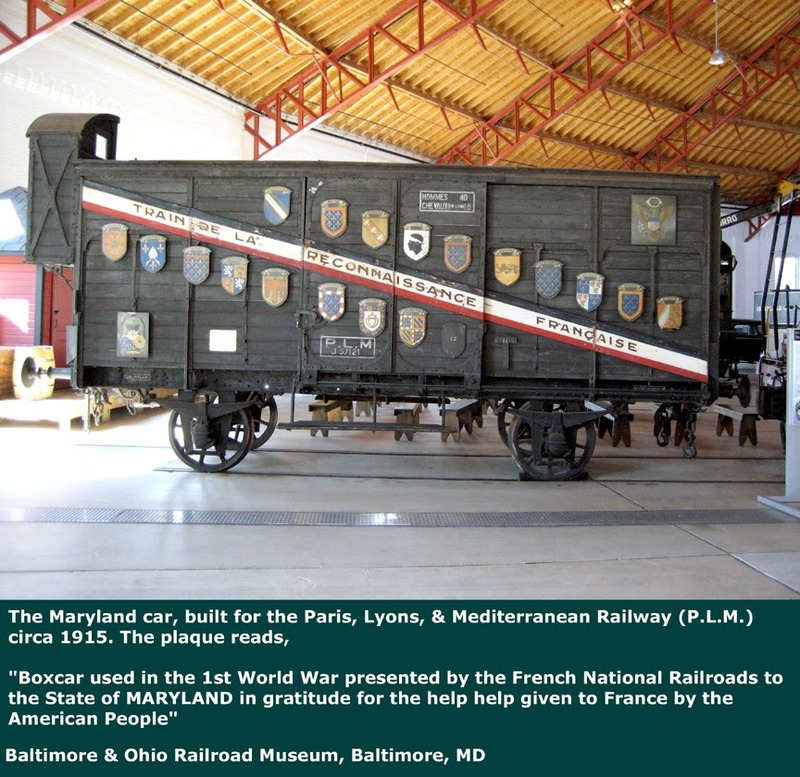 The exhibit contains authentic items that belonged to soldiers and officers of the Entente — the military-political bloc of Russia, Britain, and France — and the Triple Alliance (German, Austro-Hungarian and Ottoman empires) as well as unique icons, paintings, sculptures, and graphics (posters, postcards, flyers), military medals, military uniforms, and photographs from the museum collection. The unconventional solution of the exhibition space illustrates not the military but the ideological and spiritual confrontation between the two military-political blocs held both at the front and in the rear, as well as the role of the clergy of the Russian military in maintaining the spirit of the army. One of the sections of the exhibition is devoted to military clergy — a part of the Russian clergy involved in the pastoral care of servicemen of different arms of the Russian empire. Martial and spiritual feats of Russian priests are depicted in a number of paintings and graphic works of 1910s ("A Christmas Prayer for the Position", "Prayer at the Battery Box", "Feat Russian Priest", etc.). 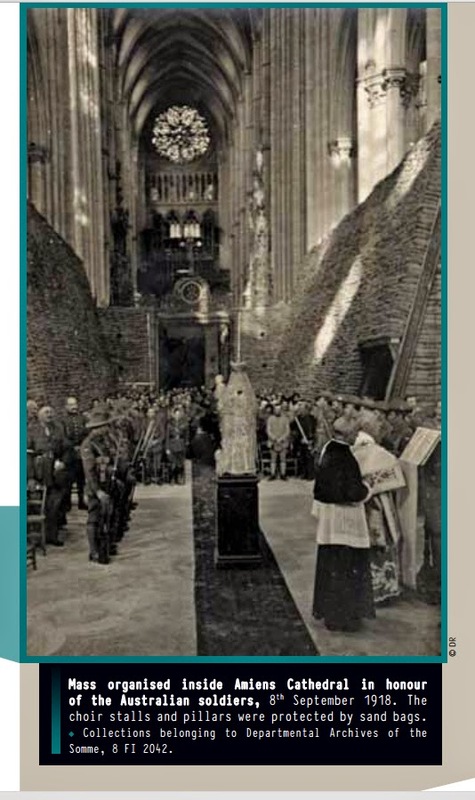 The exhibition is also complemented with documents and photos showing the awarding of orders to chaplains. A special section of the exhibition features memorial icons with inscriptions on the back. A semantic center and the completion of the exhibition will be the jewel of the museum's collection — a makeshift church of His Imperial Majesty of Consolidated Infantry Regiment (late 19th–early 20th centuries) with a set of special items, including details of military priest vestments and church furnishings, and an original candlestick made of bayonets from rifle No. 2. The exhibition "For Faith, Tsar and Fatherland" runs until 18 September 2014 at the Museum of Religion in St. Petersburg. 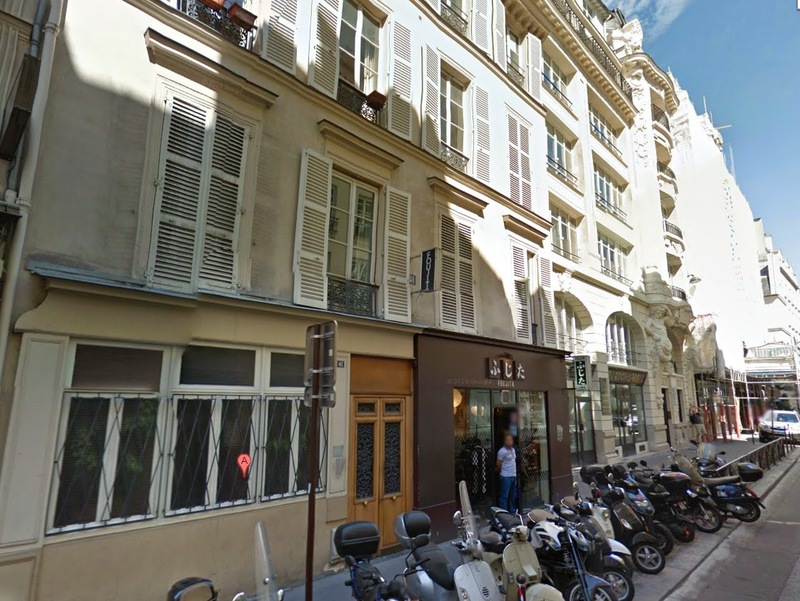 The title of this book, which refers to the address of the Paris headquarters of British spies in the First World War, 41 Rue StRoch, implies much broader coverage than is actually provided. Morgan's text focuses on just a very few of the 6,000 agents who worked for the British in WWI Europe. Their function was to watch and report on trains of German and Austrian infantry, cavalry, and artillery moving toward the Western Front though Luxembourg. This information helped Foch outguess von Hindenburg in the summer of 1918 and contributed to the "black day of the German Army" on 8 August. Yet this result did not come about easily. There were bitter "turf" wars between the British spymasters; the training of the women who coded the intelligence required considerable effort and then much hand-holding; and there were budget disputes and wrangling in general. The coded messages were sent buried within an agricultural newspaper whose newsprint had to be purchased by the British at considerable up-front expense. There was the constant fear of German capture, and the author gives interesting statistics on those who did not return after the war. The reader is not spared either, as some topics receive detailed discussions which border on the enervating. Late in the war, it became necessary to send an agent from France to Luxembourg — by balloon. First the agent, a Belgian Army officer, had to be pried loose from his commanders. Then one learns in excruciating detail about planning, launching, and piloting the balloon from France to Luxembourg. The French government was quite appreciative of the spies' efforts and awarded the participants with appropriate medals. Ominously, the Germans noted them also, and upon returning in 1940 held unpleasant discussions with some of these heroes of the Great War. Apparently, fame was not fleeting enough. You may find some of the information in The Secrets of Rue St Roch overly detailed for your taste; nevertheless, this book is an interesting and informative discussion about the underbelly of war that rarely surfaces. It is worth reading, even if you decide to exercise the option of skipping the more detailed sections. The grandson of Irish immigrants and seventh of 12 children, Frank O’Brien grew up on his family’s farm near Avoca, Wisconsin. 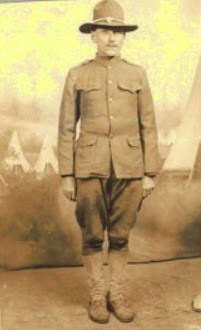 He was drafted in November 1917 and, at the age of 28, joined the 128th Infantry Regiment of the 32nd division. 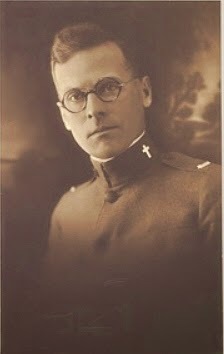 He trained at Camp MacArthur in Waco, Texas, before going overseas in February 1918. O’Brien saw action at the Second Battle of the Marne and the Battle of Soissons in the summer of 1918. At the end of August, the 32nd Division participated in the beginnings of the Oise-Aisne Campaign by seeking to push the Germans out of the City of Juvigny. 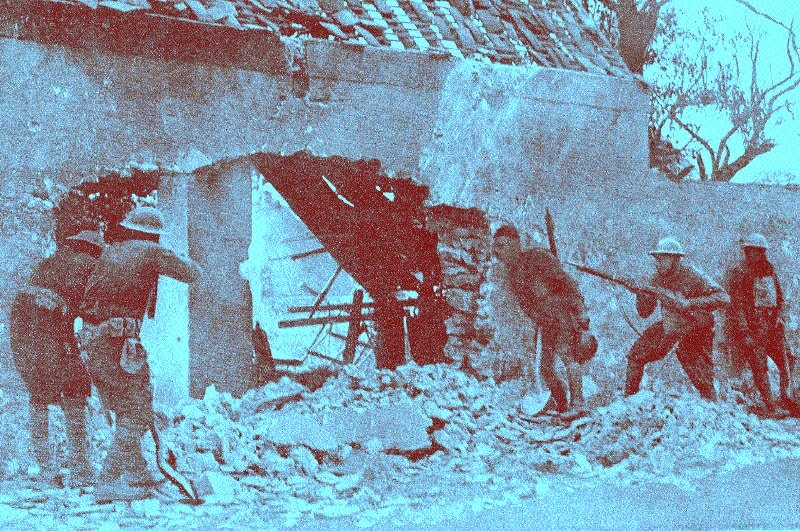 Fierce fighting with heavy casualties took place before the 128th infantry was relieved from the front lines on 1 September. Following this action, O’Brien failed to report to his company. Less than a week later, his parents were informed that Frank O’Brien was missing in action. More than half a year later, his parents received a letter in the mail from Walfred Lindstrom, an Army chaplain. 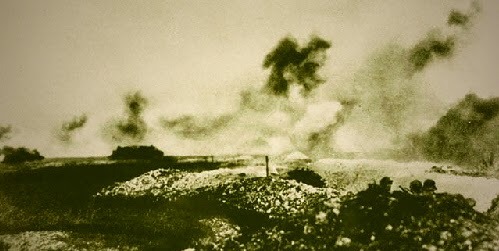 As the 32nd Division withdrew from the front lines on 1 September 1918, Lindstrom spotted an unidentified American body. Intending to bury it the next day, he removed a ring and pocketbook from the body to protect them from looters. However, when he returned to the site the following day, Lindstrom found the body already buried. In the ensuing months, he searched for some clue that might help him identify the fallen American so that he could return the items to the family. Finally, in April 1919, after returning to the U.S., Lindstrom noticed “O’Brien” scribbled in very small letters on one of the francs from the pocketbook. He looked through the casualties from the battle near Juvigny, which led him to contact the parents of Frank O’Brien, describing the ring and asking them to identify it. They recognized their son’s ring from Lindstrom’s description. Private Frank O’Brien was missing in action for over seven months before his remains were identified. He is buried in the Oise-Aisne American Cemetery and Memorial in France. 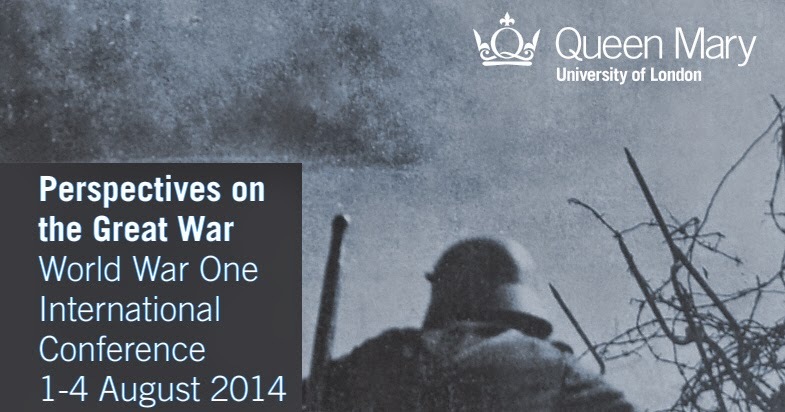 Two hundred participants, including 140 speakers, gathered at Queen Mary’s College, University of London, to reflect on issues as diverse as the causes of the war, the situation in Europe at the beginning of the 20th century, different ways of representing the war, the consequences for Europe and the world at large of the events of 1914–18, and how the war is understood today. 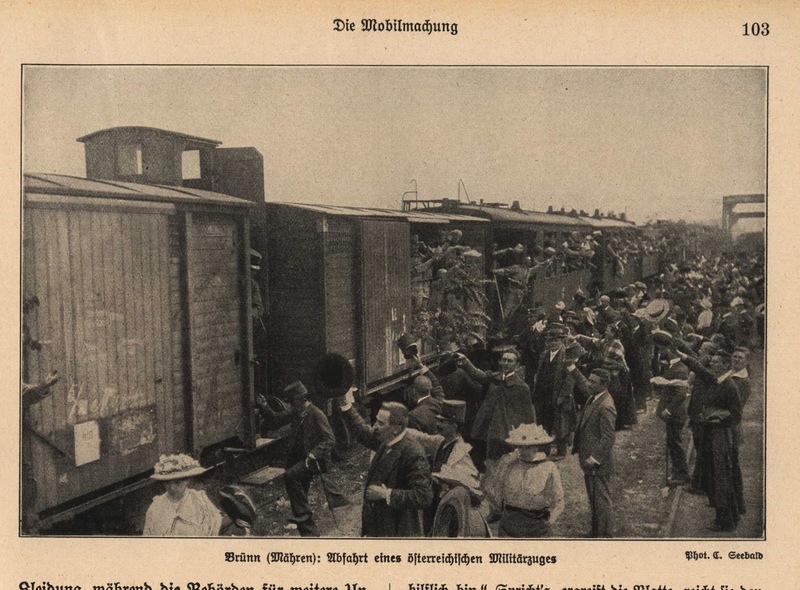 Some of the most important names in World War One scholarship were present: Professor Christopher Clark (Cambridge University), Professor Michael Epkenhans (Institut für Militärgeschichte), David Stevenson (London School of Economics and Political Science) and Professor Jay Winter (Yale University). 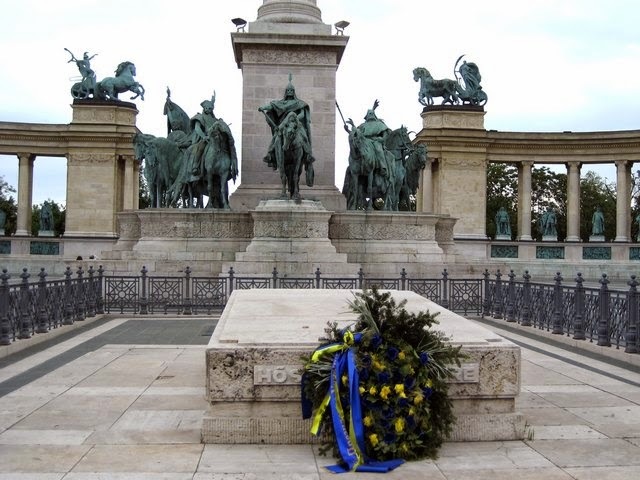 An ongoing theme was the importance of a transnational approach to World War One. Jay Winter argued that today we belong to the Fourth Generation of World War One scholars who wish to widen the scope of scholarship from battles, social effects, and the story of the individual to the story of war that incorporates North America, Africa, and India more closely. Winter exemplifies this view in his latest study, The Cambridge History of the First World War (Listen to an interview with Jay Winter about his book on http://www.youtube.com/watch?v=PFiGwzj8Uvw). The transnational perspective was also advocated by Christopher Clark, who claimed that by adopting such an approach we are better able to understand the similarities between our world today and that of 1914–18. 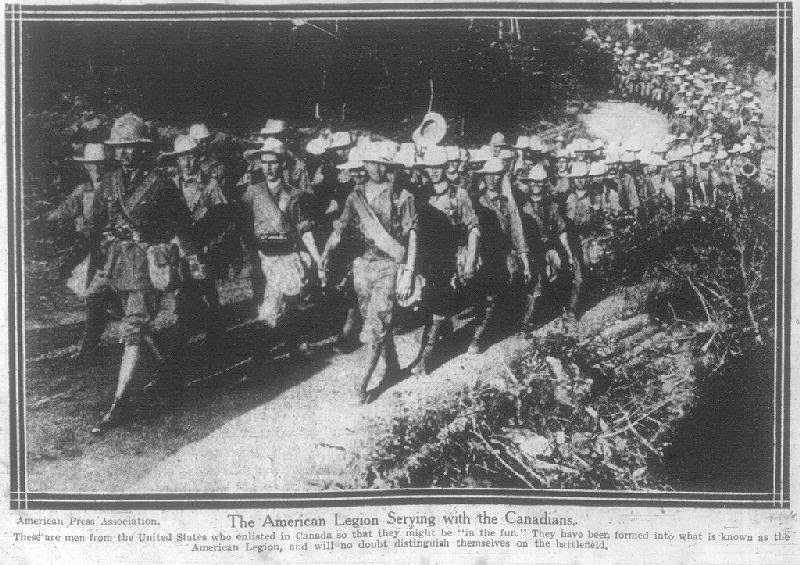 Clark referred to his most recent publication, The Sleepwalkers: How Europe Went to War in 1914. In addition to excellent keynote speeches a number of lesser known scholars presented their research on more obscure aspects of the war. One of the most outstanding presentations was that given by a South African scholar, Gerhard Genis, who has uncovered and analyzed a number of poems written by South African soldiers. 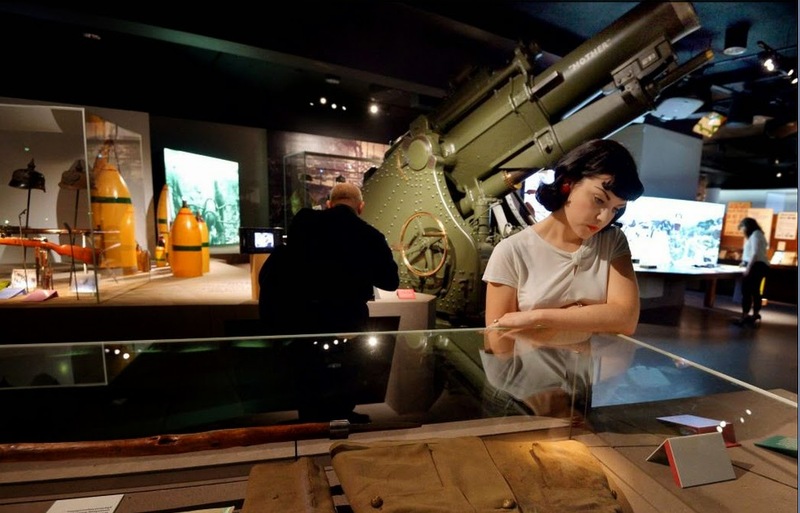 Another fascinating presentation was James Wallis’s introduction to the Imperial War Museum’s new exhibition, which is lavishly cataloged in Paul Cornish’s "The First World War Galleries".The exhibition contains interesting exhibits on pacifism, much to this correspondent’s joy! The 2014 conference is to be followed up in 2016 by a smaller event focussing on Belgium and World War One. This will also be hosted by Queen Mary’s College, London University. 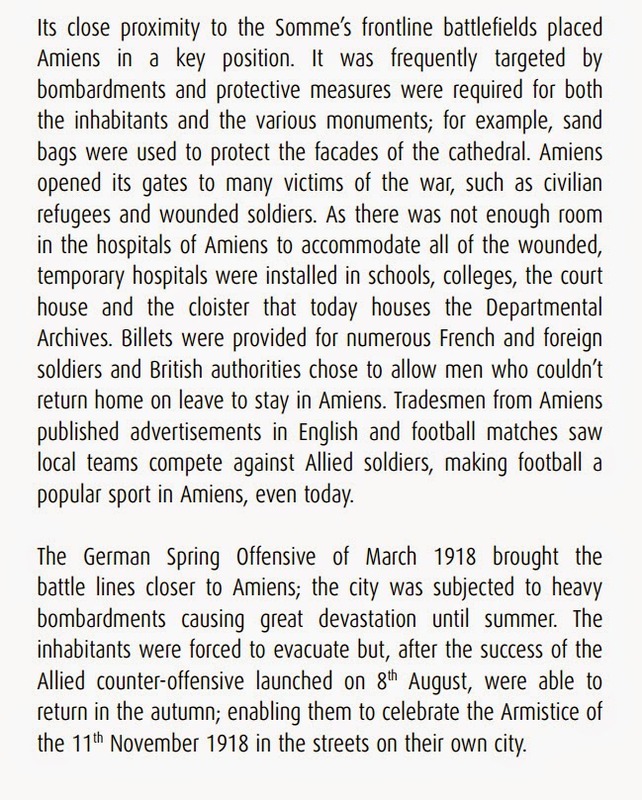 With August being the anniversary of 1918's dramatic battle of Amiens, I thought it would be interesting to remember the beautiful city that gave that struggle its name. The Somme Centenary committee sent me a beautiful brochure that included this article.